More than 740,000 of the country's 1.1 million people were expected to vote on Monday. 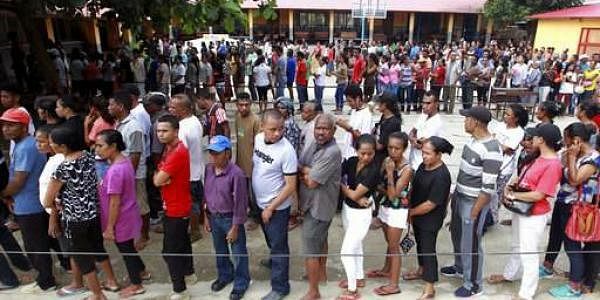 EAST TIMOR: East Timor voted for a new president on Monday in an election that will test Asia's newest and poorest nation. Francisco "Lu Olo" Guteres, a former guerrilla leader from the leftist Fretilin party, was up against seven other candidates. He and the Democratic Party's Antonio de Conceicao, the minister of education and social affairs, were the front-runners. Guteres, 62, lost to current President Taur Matan Ruak in the 2012 presidential election. But in Monday's election, he had strong support from former Prime Minister Xanana Gusmao, a resistance leader who remains influential in politics. More than 740,000 of the country's 1.1 million people were expected to vote on Monday. While an early quick count will give a reliable indication of the election outcome within hours of the polls closing at 3 p.m., official results are not expected until Wednesday.